With the news that rich Hollywood stars bribed people to get their kids into “elite” colleges, my first thought was: It’s about time the world found out about this since these people were essentially stealing those college-admissions slots from kids who actually earned the right to be there. My second thought… this is not new. 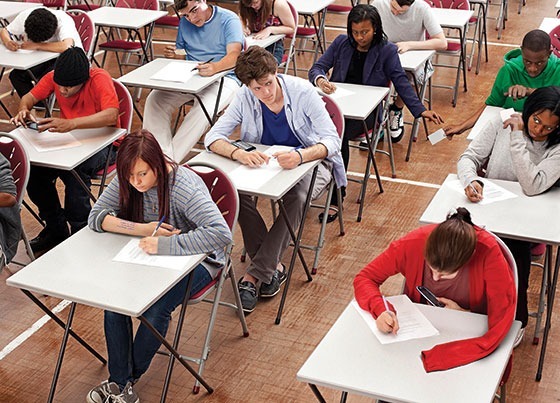 Cheating to get into college, cheating while in college, and cheating after college have been around for a long time. The scandal with high profile Hollywood stars Felicity Huffman and Lori Loughlin not only exposes the corruption of these parents, but corruption of people employed by colleges, corruption of those who administer college testing, and corruption and lack of consistency in the way “elite” colleges admit students. The core difference, in this case, is that scam ringleader, William Singer, built a syndicate to institutionalize the cheating process, managing every aspect from cheating on tests, to greasing palms of college staff, to laundering money through “donations” to a foundation. Andrew Lelling, the U.S. attorney for the District of Massachusetts, said at a news conference, “This case is about the widening corruption of elite college admissions through the steady application of wealth combined with fraud.” He continued, “There can be no separate college admissions system for the wealthy and, I’ll add, there will not be a separate criminal justice system either,” Lelling said. I’m confident Mr. Lelling will deliver that “there will not be a separate criminal justice system” for the wealthy. However, I less confident “no separate college admissions system for the wealthy,” will ever be achieved as long as colleges chase dollars and parents are willing to spend them. Public colleges establish a standard and must hold to the standard because, as government entities, there is a degree of oversite on admissions. Even then, public colleges like the University of Virginia and University of North Carolina have a base set of requirements and select from the pool of students who have met and exceeded those requirements. Still, the tennis coach at the University of Texas was arrested, so, not even a state school is immune. Private colleges can admit whoever they want. There is no accountability. Money talks… and has a louder voice. I would jokingly ask a student if “Grandpa would be willing to build a wing on the science building?” when they mentioned their desire to attend a particular competitive college with not-so-great grades and test scores. I can’t use this joke anymore. However, this has been going on for a long time. Wealthy families, powerful politicians, and generous alumni have always been able to influence admissions for their family. Although this scandal will cause this to lower its head until the hurricane blows over, this will never go away. Although I fully believe Malia Obama legitimately earned her way into Harvard, do you think there would be anyone on the admissions committee who could have sent a decline letter to the White House if she hadn’t? Why? Colleges are pragmatic. They are businesses – even state colleges. They have to make money and, at the same time, they have to balance money and the quality of students they admit. Their graduates are their legacy who they hope will go on, do great things, become generous donors… and send their kids there. Admission to these colleges is never on pure merit. Colleges will often state on their website that they taking several factors into consideration for admissions. However, they usually fail to mention those factors. Money is often the key unmentioned factor. 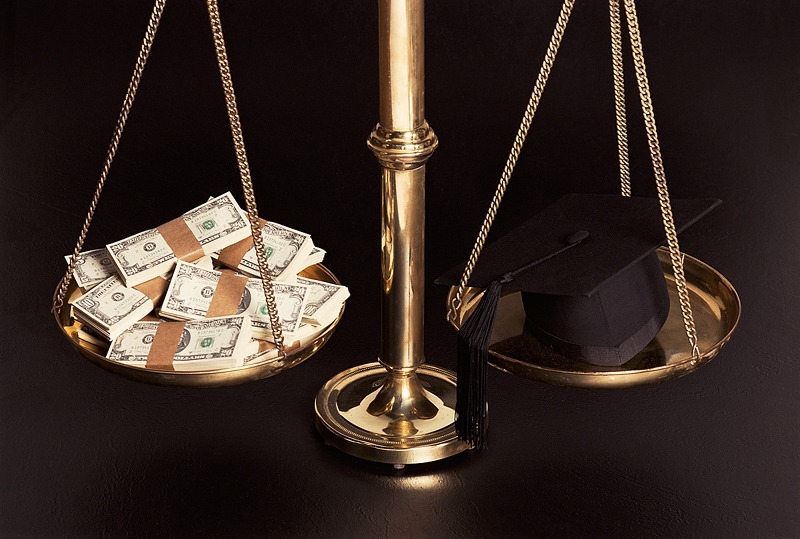 A lesser qualified student may get a significant boost when they know the family will pay full freight versus higher qualified students who checked the financial aid box. From a business perspective, colleges have to balance this out. Those that actually use a blindfold, but know the student will have to take out huge loans to attend. The college doesn’t care if they are paid from the family savings or a federal loan. Money is money. Those that keep a blind eye… and the other one open. Although all students have to meet a certain standard, like airline tickets, students are placed in First Class, Business, and Coach based on what they pay, and they need enough First Class passengers to justify lower fares in Coach. The sad thing about this scandal is that it denigrates those who worked hard to get into these schools. 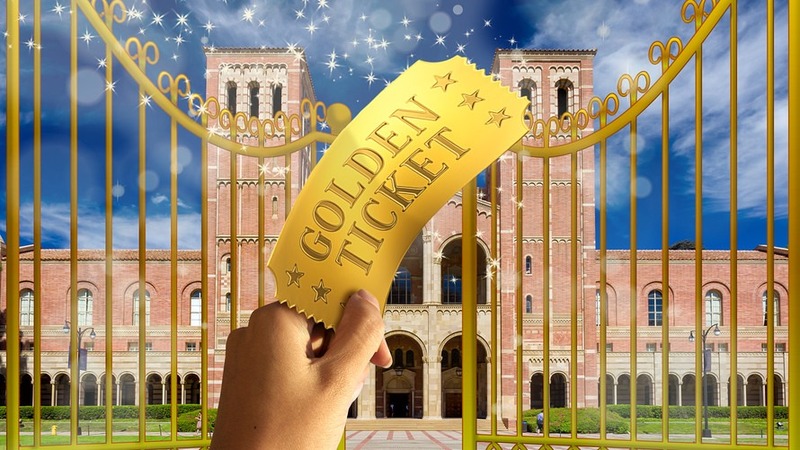 One of the strategies to circumvent the regular admissions process in this scandal was to have students admitted as athletes, who have a lower standard for admission. To me, this goes beyond fraud. Legitimate athletes were denied these slots so a coach could make a few bucks. This also brings up another issue about the double standard of admitting athletes who do not meet the academic qualifications of the college. Many colleges admit athletes as long as they pass NCAA muster — and this topic has its own bag of worms of scandals, bribes, payoffs, etc. Athletes should be required to meet the same academic requirements and standards as the rest of the students. If they don’t, they need to do what all the other students who need to boost their academics before they go to a four-year college – go to junior college. Aaron Rodgers, Cam Newton, Super Bowl MVP Larry Brown, and Hall of Famer Rodger Staubach went to junior college. Recruiting scandals and player payments are still being investigated as this is written. This is a place where the NCAA needs to step in and require colleges to drop the double standard for athletes. My opinion, as a former football coach, this is actually better for the athlete because they will get playing time in JUCO instead of holding tackling dummies for the varsity for two years. This scandal included cheating on the SAT and ACT. This has been a persistent problem. Although the SAT and ACT have tightened security, none of this security covered corrupt people on the inside. Singer advised parents to have their children “medically” documented with a learning disability so they could get extended time to take the test. Evidently, in other cases, the corrupt test administrators changed answers on a test or a 36-year-old took the test for them. I have been training students to improve their scores for over 30 years. Preparation can be demanding but pays off. To cheat like this affects everyone who took the test. Cheating still goes on in college. Dave Tomar, aka Ed Dante, author of The Shadow Scholar: How I Made a Living Helping College Kids Cheat, explained how easy it is for students to access certain “services” to write essays, even Ph.D. dissertations, for a price. However, professors are getting keen to this, and there are programs that scour the web to find the same or similar information purchased by another student and submitted by their professor for a plagiarism check. College rankings seem to play into the “elite” college myth. Some years ago, a former Chief Justice of the Michigan Supreme Court, Thomas Brennan, sent a questionnaire to a hundred or so of his fellow-lawyers, asking them to rank a list of ten law schools in order of quality. “They included a good sample of the big names. Harvard, Yale, University of Michigan… And some lesser-known schools: John Marshall, Thomas Cooley,” Brennan wrote. What constitutes an “elite” college? Certainly the Ivy League, Stanford, Berkeley, etc… What makes them “elite?” Low admission rate, high standards of admissions, etc., or just some prevailing opinion? To be clear, it was the character and work ethic that got them into elite colleges that made them successful, not simply attending an elite college. It seems that these parents had the idea that attending a particular “elite” college was critical to success. There is no study that indicates a correlation between the college and long term success. If we were to use income as a measure of success, let’s look at the numbers. Is Where You Went to College That Important? Where did your family doctor go to college? Do you know? Did you pick your doctor based on where he/she went to college? Ditto for your dentist, lawyer, and insurance agent. To close, too many people put too much emphasis on the popularity, profile, and perception that it is “elite.” “Elite” how? 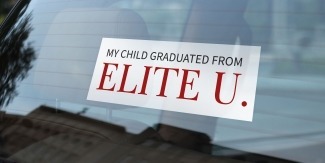 “Elite” like a country club because only kids from rich families can go? I have been assisting students in pursuing college options, choices, and opportunities for over 30 years. Many do not know the opportunities available and, indeed, half the students I work with often attend (and get scholarships from) colleges they didn’t even know existed when we started the process. There are so many good, solid colleges in the US, and admissions – and often scholarships – are within reach for even an average student willing to do above average work. It’s not where you go to college; it’s what you got out of college. Stressing Over Your College Major?